Gerhard Wiesehan is my maternal great-grandfather. He immigrated from Germany in 1866 at age 19, and became a naturalized citizen of the United States on Wednesday, March 23, 1881. According to family stories, Gerhard came from Osnabruck in Germany. Thanks to Anke Waldman's website, we now know that he came from the town of Grambergen and we even have a picture of the house in which he was born! Additional family stories, incorrectly claimed that Gerhard immigrated as a 14 year old boy but the U.S. Census of 1900, pinpoints his arrival in 1866. Another family story says that he arrived in the United States speaking no English with $5 and a bag of onion seeds in his pocket. Some said that he had the address of a cousin in St. Louis, Missouri, but this cousin remains unnamed. Family stories also said that he traveled with Hermann Bartels, a lifelong friend, who later became the Pastor of St. John's Lutheran Church in St. Louis. I haven't been able to document those stories. A New York Passenger List shows the arrival of a G. Wiesehan on 17 July 1865 in New York, Port of Departure Bremen, Germany, aboard the ship "Hansa". Birth year for this passenger was 1847, and likely could be Gerhard. At any rate, it seems that Gerhard made his way from New York to St. Louis, Missouri. There he settled into the good German-Lutheran community of Carondelet. Apparently Gerhard worked for others as a gardener and saved enough money to buy a farm with a house, probably a small acreage of about 20 acres. He married on November 29, 1873, another German immigrant, Caroline Toeneboehn. Gardening and selling produce could be a successful business but it was labor intensive. Gerhard now had a wife who could work with him and Caroline played an important part in their farming operation. 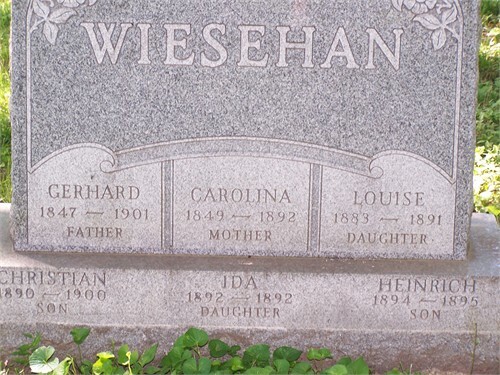 The couple also started their family and were soon busy raising their children, one of whom was my grandfather, *Edward William Wiesehan born in 1879. As soon as the children were able, they too helped and worked in the family gardening business. Tragedy struck in 1892, when Caroline and her new baby, Ida, both died shortly after the child's birth. Gerhard was left with eight children to raise and the demands of his farm. He really needed the assistance of a wife and soon he found a young widow with two small daughters*. Gerhard and Mary Trampe Breihan were married in 1893. Mary and her little girls moved into Gerhard's home where she became his wife and step-mother to his children. With Mary's help, Gerhard continued gardening and working. Together he and Mary had three more sons, only one survived to adulthood. Gerhard died on April 21, 1901. The cause of death was listed as Typhoid Fever. Gerhard was known for being a successful gardener, industrious and willing to work hard. He was respected in his community as a good husband and father. He was a staunch and faithful Lutheran. Gerhard supported his church with his time and money and he and his family attended church services regularly. He was buried in Concordia Lutheran Cemetery with his first wife, Caroline. Now a quite interesting relationship developed between my then 14 year old future grandfather, Edward, and his new step-mother's daughter, Anna, who was only 7 years old. At first, we are told that Edward hated his two little step-sisters and resented his new step-mother as she assumed the role of his father's wife and his mother. As time went by, however, Edward's feelings changed. He learned to accept his step-mother and he fell in love with her daughter, Anna. When Edward later told this story to his own children, he said that he had to wait for Anna to grow up so that he could marry her. Then when young Ed and Anna told their Lutheran Pastor that they wanted to marry, he supposedly exclaimed, "What! You can't marry your sister!" The Pastor had to be reminded that they were step-siblings, living in the same family but not related by blood. Edward William Wiesehan and Anna Breihan were married in 1904. My mother Nora Angela Wiesehan Braden (1916 -1986) was one of eight children born to that marriage.